William Pryor Letchworth had a deep love of poetry. His library contained many collections of poems, but it is likely that "Voices of the Glen" was his favorite. 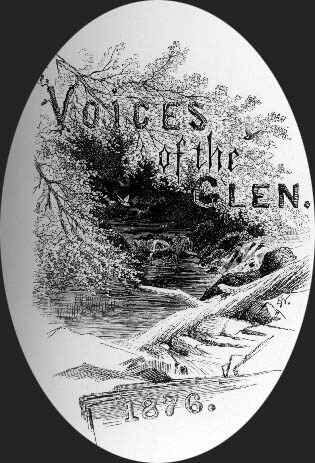 "Voices of the Glen" is a collection of poems written at the Glen Iris Estate. They were written by family and friends who followed the tradition of leaving their host a bit of prose, poetry, or art before returning to the world beyond the Genesee Valley. Mr. Letchworth first collected the works into a hand bound volume which was illustrated by photographs taken in and around the Glen. In 1876 he published a small bound volume which he called "Voices of the Glen." The image to the left is an illustration from that original edition. Among the contributors were James N. Johnston, David Gray, W.H.C. Hosmer, and other family and friends. One of Gray's poems is found below. In 1908 Mr. Letchworth began work on a new and enlarged edition of his "Voices of the Glen." With the help of longtime friend James N Johnston and Caroline Bishop he worked on the project for the next two years. Almost a dozen new poems would be added, along with new illustrations. Although his health was failing, the work brought much joy to Mr. Letchworth. He completed the work early in 1910 and in November corrected proofs from the publisher. It was one of his final projects, for he died only a few weeks later on December 1st. The project was completed by Johnston the following year. 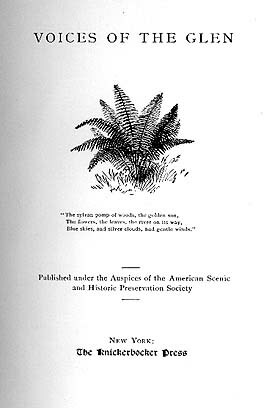 The image to the right is the title page from the 1911 edition. To Thee, sweetest valley! Glen Iris, to thee! What thou whisperest to us we never can tell. And the sunlight flings o'er thee the glories of heaven. The beautiful home of a beautiful heart.